Mark’s home was a place where the disciples met together – the first church – a special place. Take a moment to think about the places and people who are special to you. The places where you find fellowship. If you wish to, tear off a piece of bread and eat it with thankfulness for the fellowship you share. Mark is actually naked when Jesus is arrested, he is fleeing, frightened, not able to control things. Sometimes we feel like this too. Is there anything that is frightening you at the moment? Can you trust God with it? If you would like to, pick up a piece of cloth and feel how flimsy it is, place it on the cross, remembering a time when we felt weak. Or pick up a stone and feel the weight of it – our burdens can feel so heavy – place it at the foot of the cross remembering that Jesus promised to take our burdens and give us rest. Mark had a cousin, Barnabas, who invited Mark to go travelling with him and St Paul. Mark quit after a few months and Paul was furious. Later, Barnabas wanted to give him a second chance but Paul refused. A big row happened, ending with Barnabas journeying with Mark and Paul going in a different direction. Sometimes relationships break down. Sometimes we let people down. Sometimes it is hard to forgive, especially when we are still hurting. If you would like to, pick up a nail and think about anything you would like to confess to God. When you are ready, put the nail back down as a sign of forgiveness. Later Paul, Barnabus and Mark made up and Mark travelled to Rome to look after Paul in prison. Both St Peter and St Paul were so fond of Mark that they called him their son. Think of people in need – those in prison, or in war torn countries, or those who are sick or grieving. If you would like to, light a candle and say a prayer for them. It is believed that it was St Peter who filled in the missing details for Mark when he wrote down the Gospel. Mark’s Gospel was the first to be written and it was the basis for the Gospels of Luke and Matthew. Those who know about Greek say that Mark’s Greek is not very good – it is a rough and ready text in very inelegant Greek. But Mark used the skills and knowledge that he had and give us the wonderful gift of his Gospel. This text has transformed the lives of people down the ages. If you would like to, pick up a pebble and think about the people who have helped you. Put the pebble in the water and watch the ripples. Pray that you may help other people and that the effects might transform people’s lives. Later, Mark travelled to Alexandria (in Egypt) and started a church there – which is now part of the Coptic Church and aspects of the Coptic liturgy can be traced to St Mark himself. He is credited with bringing Christianity to Africa. St Mark was a great evangelist, is there anyone who you could bring to church so they might know more about God? Take a moment to pray about this. On the bookmark there is part of the ancient liturgy of St Mark… Please take a bookmark to remember this journey. At St George’s yesterday we considered the stations of the Cross using Ignatian Meditations – they are here. Each station led me into a greater understanding of the injustice, the pain, the horror of our Lord’s Passion, and the response of those around him on his journey. Christ’s own response was love, dignity, forgiveness and acceptance. Christ was carrying the cross for me in some mysterious way. Carrying it for all of us. And doing it willingly. There is an Easter labyrinth up at st Mark’s that we have set up. People have been telling me how helpful it is. If you want to walk the Labyrinth then go up to St Mark’s tomorrow between 10-12. Alternatively here is an online version! I was born in Rome, and from an early age I wanted to be a Roman Solider. So I joined as a cadet at the earliest opportunity, and when I gained my commission it was a very proud day. I was given my uniform constituting a shiny breast plate for protection, a round leather shield; a stout dagger held in a leather sheaf, a fine plumed helmets, leather sandals that where comfortable for marching and supple enough for running, all finished off with a natty leather skirt. At that time the Roman Empire expanded and as we occupied new territory we bought law and order, civilisation, introduced new culture, improved construction techniques and built straight roads; it was all good; As the Roman Empire grew we were required to work away from home in a peace keeping role. We called it being on tour. At one point I was posted to an area called Judea. There were certain rebels and some civil disobedience but there were methods of control from a few nights in jail right up to execution in the form of crucifixion. Now on a previous tour I had to officiate at a crucifixion. The convict suffered a long and painful death and I was of the opinion that however bad evil or nasty a person was; this punishment was far too over the top, in humane, overly cruel and barbaric. It was for that reason that when rotas were issued for future crucifixions I made sure I was at the back of the queue. However and inevitably the time came for me to officiate at another crucifixion which seemed to be quite high profile as there were to be three criminals and it was to be held at a place called the skull which was a rocky mound just outside the city gate. It was a busy thoroughfare and so many people would pass by. Even if they did not stop to look they would know what was occurring; it was to be a very public execution. My task was to guard the spot prior to the prisoners arriving. It was tradition that the condemned would carry their own cross to their place of execution. I saw them make their way but one had another person carry his until they got close and then swapped. I could see why as this man had obviously been badly beaten and he barely had enough strength to carry his cross the last few steps. He was wearing a crown of thorns and congealed blood on his face. It was custom for the charge against the condemned person to be written on a plaque on the top of their cross. Two of the criminals had a plaque that read “Bandit” The third His name was Jesus had three plaques and an inscription which read “The King of the Jews” one was written in Greek, one was written in Latin and one was written in Hebrew. These were the languages spoken by the people in that place at that time. This meant that all passers-by, whatever their nationality would be able to read that his crime was being King of the Jews. The crosses were set up and the first man looked terrified he tried to struggle and get away, but we over powered him and he was tied to the cross with ropes. The second man was calmer and seemed to accept his fate as we strung him up. With the man Jesus we were told to nail him to his cross. There was a small ledge in the middle of the upright, which he was positioned on with his crutch carrying his weight. Then his left arm was outstretched and a club nail was positioned between the bones in his wrist. The nail was driven through his flesh and into the wood into the wood. His right arm was outstretched and through the joint in his wrist the nail was driven through his flesh and in to the wood. His body was then lifted up off the shelve and his feet were nailed to the cross through the joints in his ankles. The reason for lifting the body of the ledge was to remove support to his legs and back so to make the pain even more excruciating. After about three hours Jesus cried out and seemed to be talking to his Father and then he said that he was thirsty. We had a jar of cheap wine and as an act of compassion I filled a sponge with it and offered it to him to drink. My plan did not work as he would not drink. My colleagues thought it was funny and jeered at Jesus, and then the crowed got a bit excited and there was some pushing and shoving and they cried out “if you are the Messiah save yourself and come down from the cross”. “Jesus remember me when you enter your Kingdom” – he had recognised Jesus for who he was. Yes well OK I don’t actually know what paradise is, but I imagined it is a positive harmonious and peaceful. And here was a man at the worst possible place moments from death and in agony on a cross and yet by a chance meeting with Jesus his life was to be transformed to a highest level. It was not something that was distant or he had to wait for, as it was to happen that very day. At a moment there was a cloud formation over where we were. The clouds got darker and darker and although it was daytime it seemed like dusk. It was atmospheric a little bit frighten as we did not know what was happening. Then Jesus cried out again and breathed his last. He was the first to die and we waited and then after a while the other two died in relatively quick succession. We wanted to make sure so we bust their legs – there was no reaction so we knew they were dead. We had been told not to break a bone in Jesus’ body and to check he was dead the centurion pierced his side with his sword. Blood and water flowed from the wound. And he announced in a loud voice “Truly this was the Son of God.” It was at that moment I was fuelled by shock and horror as I realised that I had been part of and complicit in the execution of an innocent man. But not just any innocent man this was Jesus the Messiah , Jesus the King of the Jews, Jesus The Son of God. The corpses were taken down from their crosses; my shift was over. I went back to my room sat down and was physically sick, I could not eat or sleep, constantly thinking of the events of that day. On the third day after the event something happened to me that I couldn’t completely understand or explain, but in a moment I felt the burden of my guilt suddenly lifted from me and I knew that my life had changed from that moment on. Look what they have done to him, my boy, my beautiful boy. Oh I know he’s a man but he will always be my boy. Why have they done it? He didn’t do anything wrong, in fact he healed people he made them whole again. What are they so afraid of? I don’t understand. Yet even when he was up there, in agony he was still thinking of others. He looked down at me standing there with my sister and he said to me, “Mother behold thy son.” And to John he said “behold your Mother.” Even at that moment of suffering he was thinking of me and making sure I would be alright without him. Will I be alright? Can I go on after this? Do I have the strength? I pray God will help me. It’s so different from the day he came into this world, that tiny baby who caused such a stir heralded by angels and especially bright stars. Everybody was so excited, desperate to see him. The simple shepherds smelling of earth and animals rushing down from the fields bringing a lamb with them. The grand Magi who had travelled so far bringing wonderfully fragrant oils and spices and gold!! It wasn’t always easy being the mother of the son of God. I remember the time we travelled to the temple in Jerusalem for Passover and then on the way back after a whole days travelling we discovered he wasn’t with the group. Frantically we rushed all the way back and searched all over Jerusalem. I was out of my mind with worry and after three days we found him talking to the elders! He was so surprised that we were worried, after all, he said, he was in his father’s house! We travelled to Jerusalem for the Passover again this week. I was in the crowd when Jesus entered the city on a donkey of all things! They greeted him like a King, shouting “Hosanna” and laying palms and coats before him. everyone was so excited, here was their King at last the Messiah they had been promised. what happened? How did it all change so quickly? It was only a few days ago. I was so proud when he began his ministry and stories came back about miracles and healings and hundreds of people following and hanging on his every word. I couldn’t wait for him to come to Nazareth and then there he was in the temple reading the Torah and speaking so eloquently, everyone was so impressed, they couldn’t believe it was my son. But then as he continued telling them the reading was about him the mood changed they became angry. They chased him out of town, his town, where he was brought up. And now they’ve done this to him. Why? How has he made them so angry, so afraid of him? Have I got it wrong? Could it be that he’s not the son of God? Would God let this happen? What’s the point? What has he achieved? And yet Simeon warned me all those years ago “a sword will pierce your own soul”. How right he was as I watched them condemn him, whip him, ridicule him. As I heard those nails being hammered into his hands and feet my heart was torn in two. Why? What has been achieved? O God help me to understand why. What is your plan? Please show me. I don’t know what to do. I`ve no one to talk to. Maybe you lot can help. Obviously I can`t ask him, and the others, well, to be honest I’ve never been comfortable with them. Especially that Peter, sorry I don`t like him, obsequious little….master this and master that and shall we build a tabernacle and can I sit next to you in heaven, ok that was the others, but they`re all the same. They haven`t a clue. All they can think about is the rapture and Yahweh sending his angels down. Total cop-out. Me, I don`t believe that stuff. If anything is going to happen it`s up to us to get it going, down here, on the streets. I`ve been a kicking against the pricks all my life, school, estate, if something wasn`t right, me, I`d be there. At first it was the Romans, till I realised that it was the priests, especially the Pharisees. It`s them who make it impossible to survive, all this stuff about a righteous remnant and the only ones who are going to be saved will be those who pay their temple taxes and stick to every ruddy iota of the law – and of course avoid any work for the Romans. That`s what really attracted me to him in the first place. He`s really got it in for the Pharisees, and the landlords. He`s on the side of the weak, the damaged, the outsiders, the publicans – word on the street is that his dad was one. Well, that`s me as well, so obviously i joined up. What we need now is a leader and he could be the one. I mean, look at what`s happened; I mean, he arrives in Jerusalem and the place goes mad; he was mobbed, he`s a superstar. So what`s my problem? Well it seems to me that he`s been ratcheting up the pressure, but something has to make it explode. He can`t do it on his own. The Romans are a canny bunch, no way they`re going to risk a riot, so someone has to take the initiative. And I think it`s meant to be me. I think he`s telling me. The other night he slapped me down over the woman and the oil, but i think he was telling me to go ahead, to light the fuse; all this time he`s been saying give it away to the poor and that`s all I was saying about the oil so it made sense. He was saying I was right all along, so go ahead, it`s up to me. He needed the authorities to move on him, but they`re scared, they need someone on the inside. And there`s this voice inside my head which says it`s me. That way, they`d go for him and then the people would really rise up. They need me. More to the point, he needs me. History will tell. I mean, Caesar is our Emperor and just because the Jews have a king, they think they can just do what they like. I’m sorry, I haven’t introduced myself, have I? I’m Claudia Procula, you might know me better as Mrs Pilate. Yes, that’s right, Pontius Pilate the Procurator is my husband and my goodness, is he having a tough time at the moment. We’re generally happy though, it’s nice in Caesarea, I’ve got a very comfortable villa, well I don’t like to boast – but it’s a palace really and it is well away from these Jews, I could almost imagine I were back in Rome. I wasn’t best happy when Pontius came to Judea, but I know what it means to him. He’s trying to get on, to impress Emperor Tiberius – not that the emperor cares much about us, he’s retired to his villa at Capri. Still I understand that and I support Pontius. The Jews and their festivals. This one is Passover, they call it Pesach. Jerusalem is full, everyone from miles around has come – it’s the big one. And of course, that’s why Pontius had to come. We don’t want any trouble flaring up. Well, it was nice to see all my Jerusalem friends again, and I was out shopping with my friend Augusta – she had one of the chi-chi villas out on the west side. We heard this kerfuffle coming from the Temple, so we had to go and see what was happening and just at that moment someone came running out yelling, “I can see, I can see!” We went a bit closer and I caught sight of the man in the midst of the throng, he just looked like a country rabbi, not a city dweller and then he saw me. I won’t forget his eyes. It was as though they through me to my very being and time stood still. Well, I turned away, straight away, but I sent our servant Marcia to find out who he was. Marcia said, “His name’s Jesus, they are calling him the Son of David and he is healing people. He makes blind people see and the lame to walk again.” Just then, I spotted some of the city guard and Augusta and I bid a hasty retreat. It’s strange though. I couldn’t get him out of my mind, I remember his eyes on me and it was as though he called my name. And then Pontius came home. He’s been aloof recently, not wanting to talk to me – we usually chat about my day and his, but he didn’t even want to see the new silk I’d bought. The next morning he went off to work again, there had been a big to do in the night, Pontius said there’d been an arrest over in Gethsemane and he might be needed. You see, the Jews can try their own criminals, but they can’t execute them, they can’t crucify them and if there’s a real trouble-maker been caught, it’s sometimes best if he doesn’t ever get the chance to be a nuisance again. I was daydreaming. Well, I’m not sure, everything seemed so real to me. A beautiful man, I saw him, he was sinuous, like a snake though – something not right about him. The next I knew, he was round behind me and he whispered in my ear, “Your husband holds sway over the life and death of a holy and saintly man. His name’s Jesus, who calls himself Christ. You must be sure your husband doesn’t pass sentence on him, for if he does you’ll both be utterly destroyed.” I came to screaming, there was no one there, but Marcia ran in to see what had happened. She’d seen no one, but it was all so real. There was that name again, Jesus. Was Jesus the man they’d arrested in Gethsemane? Jesus, the one who’d healed blind people, lame people? Jesus, the man with the eyes that look into people’s very being? Pontius came home at lunchtime. At the moment he received my text, he was sitting in judgement on that very man. He could find nothing against him. But the Chief Priests and the Elders wanted him dead. Well there was nothing Pontius could do, Jesus didn’t even try to help himself. Pontius even offered the decision to the crowd, would they save Jesus, their king? At their festival? But no, they would have Barabbas – well that’s borrowed time for that villain. So Jesus was flogged, but still he wouldn’t say anything in his own defence. Well, that set the cat among the pigeons. At least Pontius knew why the Chief Priests and Elders were set against Jesus, it threated them you see. Pontius just washed his hands of the matter, he knew he was sending an innocent man to his death, but what could he do, there would have been a riot? And now, he’s had to go out again. There’s trouble. 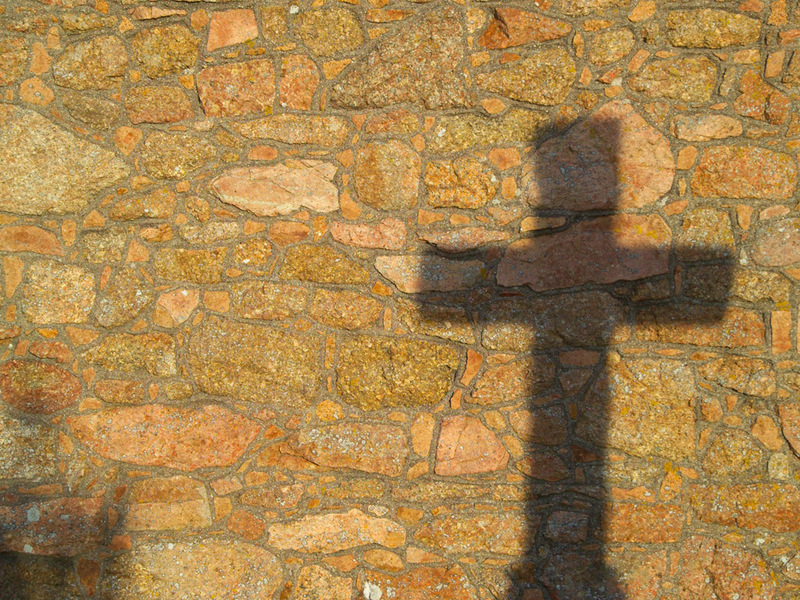 Have we really just killed the Son of God? In Caesarea, they also found a block of stone with a local Governor’s name carved on it. Tell us the story. What does that tell us about the society and the politics of that time? Yes, this inscription that’s now been found at Caesarea Maritima, which refers to Pontius Pilate, is one of the most important discoveries made in the archeological work of the last two decades. Precisely because it’s the first piece of hard evidence of the existence of Pontius Pilate. Now, for Pilate, of course, we have a number of literary references, both in the Jewish historian, Josephus, and also among the Christian gospels. But this is the first piece of direct evidence from an archaeological source which actually gives us his name and tells us he was there as Governor. The city of Caesarea Maratima was actually the Governor’s residence. This was the capitol city, from the perspective of the Roman political administration. So, it would have been where Pontius Pilate would have lived, where he would have had his court. And what does that tell us, because if Herod ruled the city, if Herod was the local client King, what was Pontius Pilate doing there? Herod ruled from 37 B.C.E. to 4 B.C.E. Quite a long and impressive reign from just the political perspective. But, at his death, his kingdom, which was the largest extent for the Jewish state since the time, really, of David and Solomon, was subdivided among three of his sons. One son, Herod Antipas, took the northern territories of the Galilee and those on the east side of the Jordan River. Another son, Phillip, took the areas to the east of the Sea of Galilee … the area now thought of as the Golan Heights, and a good stretch of territory over in that direction. The third son, Archelaeus, took the major portion, and in fact the most important cities… Now this region, which we would probably call Judea, was really the most important of the three sub-divisions. But Archelaeus, in contrast to his two half-brothers, didn’t fare as well as his father. And within ten years, he was removed by the Roman overlords, and replaced with military governors … what we usually refer to as Procurators, or Prefects, posted there by the Roman administration to oversee the political activities of the state. 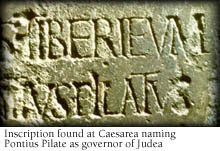 Pontius Pilate, is one of these first round of governors posted to the province of Judea, once it was given over to Roman military governorship. And the stone that we now have from Caesarea … is very important. It gives us three pieces of information. First, it tells us that Pontius Pilate was the Governor. Secondly, it calls him a Prefect. That’s what we see in line three of the text. Thirdly, and in some ways most interestingly, the first line tells us that Pilate had built a Tibereum. What that means is, a temple for the Emperor Tiberius, as part of the Imperial Cult. Thus, here we have, at Caesarea Maritima, a Roman Governor building a temple in honour of the Roman Emperor.